The competition is part of a celebratory weekend which also includes a concert (featuring 15 of our favorite singers) and dinner in honor of Speight Jenkins’ three decades at the helm of Seattle Opera. The International Wagner Competition (also known as “Wagner Idol”) on August 7 is an all-Wagner concert conducted by Sebastian Lang-Lessing, who has extensive experience with Deutsche Oper Berlin. The singers will compete for two prizes of $25,000, to be awarded by a distinguished panel of judges. The audience and orchestra will also play an important role in the competition. Both groups will award a prize of $5,000 to their favorite artist. The judges for Seattle Opera’s third International Wagner Competition are an international group of authorities in all aspects of opera production—mezzo soprano Stephanie Blythe, who has spent five summers in Seattle singing Wagner’s Ring; Peter Kazaras stage director, tenor, and Director of Opera Studies at UCLA; Bernd Loebe, the Director of Opera Frankfurt; François Rochaix, director of Seattle Opera’s Ring from 1985 to 1995; and Stephen Wadsworth, director of Seattle Opera’s Ring from 2000 to 2013 and Director of Opera Studies for the Juilliard School. The first International Wagner Competition was held in August 2006 and made possible by a grant from the Charles Simonyi Fund for Arts and Sciences. Mr. Jenkins created the competition to identify and recognize qualified, emerging opera singers who demonstrate clear promise of an important career in the Wagnerian repertoire. Irish soprano Miriam Murphy and English baritone James Rutherford won the competition in 2006. 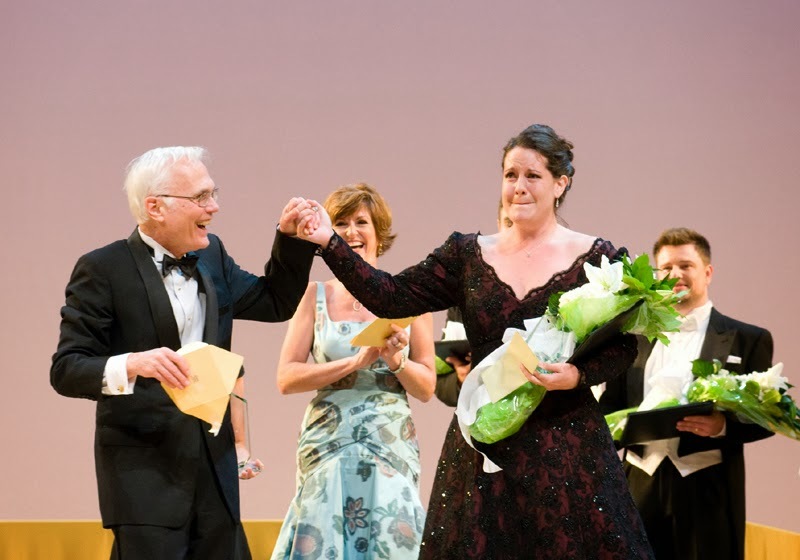 South African soprano Elza van den Heever and Swedish tenor Michael Weinius won the second International Wagner Competition in 2008. Since then, these four prize-winners, plus many of the other competitors, have gone on to significant artistic accomplishments at opera houses around the world. Tickets (ranging from $46 to $66) for the 2014 International Wagner Competition are available online, by phone or in person. For more information, call 800.426.1619 or 206.389.7676 or visit www.seattleopera.org. For detailed bios of the finalists, CLICK HERE. For more information about the judges and the competition, CLICK HERE. Photo, top, of Speight Jenkins announcing Elza van den Heever's victory in 2008, by Rozarii Lynch.